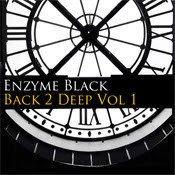 Enzyme Black Recordings are back with a 3 track EP of Deep House Flavours. Already roadtested by a select collection of DJs this heavy selection brings back some of those old school US House flavours in a more contemporary package. The majestic ‘Time of Mine’ features Deep Rhodes chords, a killer bassline and jackhammer beats. The stop-start DJ style edits give it a New York flavour with just a touch of Hip Hop attitude. The middle eight takes things darker with a stab riff that commands attention leading into the drop with the siren like synth bursts. The Beautiful ‘Digital Lust’ is a sultry love affair set to a soundtrack of filtered strings and deep sub bass. Middle Eastern percussion tripped into oblivion provides a rhythmic bed onto which the manipulated vocals moan and purr sensously. Finally ‘Back 2 Deep’ hits hard and energetically with a retro polysynth riff backed up by B4 Hammond Organ, Piano and a wicked Synth bassline. Tough breakbeat tinged House rhythms, warm pads and relaxed flute complete the package.